The Operations Manager of Sandown and Shanklin Independent Lifeboat said the continued support for their work is “very humbling”. Well done to the choirs and all who donated. Last month the Newchurch Male Voice Choir gave a concert along with the Cor Meibion Llanellie Male Voice Choir and Island’s female harmony singers Cantobelle. Donations were collected on the night for the Sandown and Shanklin Independent Lifeboat Station and last week a cheque for £416 was presented to the lifeboat volunteers. 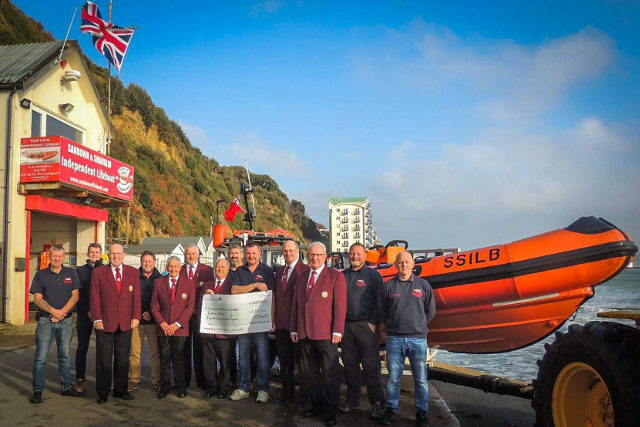 “We are proud to present the proceeds of a very successful concert with the Cor Meibion Llanellie Male Voice Choir and the Island’s Cantobelle Harmony Singers, to Sandown and Shanklin Independent Lifeboat.